LOL. There were no leftovers. I cooked up just enough for a serving. They have their own yummy food. Personally I prefer the Doritos Cool Ranch! Also full of preservatives and quite bad for ya! 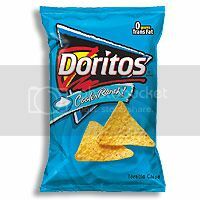 I like the cool ranch/taco mixed Dorito's. Somethin' about 'blast'. I see that Dorito's has brough back taco flavored. Good for them, my all time favorite. Does sound really good. We love cabbage, but usally boil it and have it with a bit of vinegar & pepper. I like to make this cabbage soup with leeks, onions, green pepper, beef bullion, canned tomato's, packet of onion soup mix, in a low sodium V8 Veggie juice base. Leeks give it a nutty flavor. Breakfast was an egg sandwich. Lunch was ham & cheese sandwich. Dinner was pancakes with fresh preserves. Breakfast: Egg Beater omlette, two turkey sausage patties, a banana. Well Lynne theres no correct way to prepare baked beans over here, they're straight from the can, just heat and pour them on your toast. You are absolutely correct about preparing tea, you've always have to warm the teapot first (my Mum taught me that, my Mother drinks so much tea, even when she went camping she would take a china cup and saucer for her tea )At work we always heat the teapot/coffee pots, cups and saucers.. Personally I prefer flavoured teas such as pomegranite and grape, or blackberry and apple and so forth. I can't wait to go to the US, Chunky Monkey icecream is on the list of the "Must Eats" along with doughnuts and hotdogs (I know I have watched to many cops and robber movies ) and I want to go to a "diner"
Ya know, NJ is known as the state with the most diners. doughnuts? Hot dogs? Ya'll dont' have doughnuts there? !